While it ultimately was a short stop that marked the end of his NBA career, Michael Jordan's time with the Washington Wizards was headline-worthy, even if he was not the same player from his Chicago days. Like his autographed cards from the same period, Michael Jordan's game-used Washington Wizards cards present collectors with more memorabilia options for the greatest player of all-time. 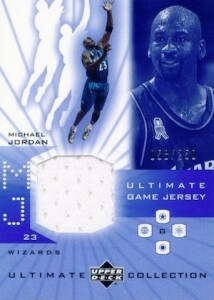 Michael Jordan's Washington Wizards relic cards come from a very narrow period in the hobby. Because he only played two years with the Wizards, starting with the 2001-02 season, the majority of the game-used options are found among 2001-02 to 2003-04 products. While they might not carry the same appeal as his signed cards, they still offer collectors something with a direct connection to Jordan and can be much more budget friendly. 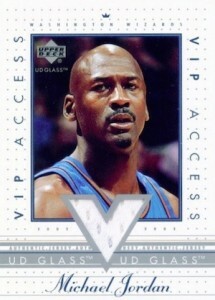 Ten of the top Michael Jordan game-used Washington Wizards Cards can be seen in the guide below. Click on the listing or images to shop for singles on eBay. 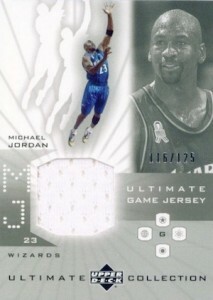 One the few Michael Jordan game-used options found in 2001-02 products, Ultimate Collection offers collectors three tiers, each with a different print run. The Silver parallel is numbered to 175 and the Gold is limited to just 50. 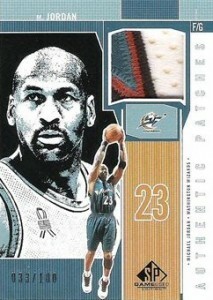 There is also a another card option with a different image of Jordan. 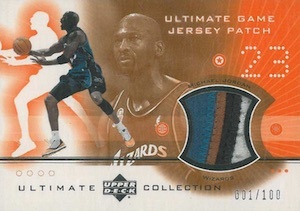 Also found in 2001-02 Ultimate Collection, the Ultimate Game Jersey Patch cards take Michael Jordan game-worn Wizards cards to another level by adding a patch and print run of 100. There are also Silver (#/25) and Gold (#/10) parallels. 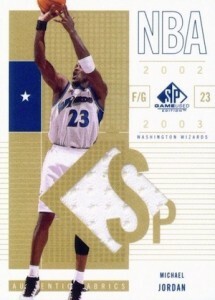 Technically part of the 2002-03 SP Game Used base set, this short-printed jersey card for Michael Jordan features a clean design and the die-cut "S" over the jersey piece gives it a distinct look. 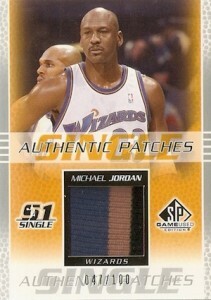 Another opportunity for collectors to track down a game-used patch for Michael Jordan, the blue image of this SP Game Used Jordan card works well with the color scheme of the Wizards. A print run of 100 means they are rare, but not impossible to find. 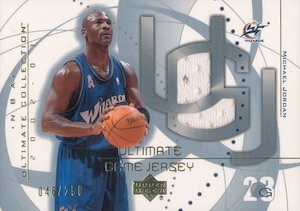 While the jersey piece is plain and on the smaller side, the Michael Jordan Ultimate Collection card is helped by an appealing design and the brand power of Ultimate. There is also a Gold parallel, numbered to 50. With awesome in the name, how can you go wrong? 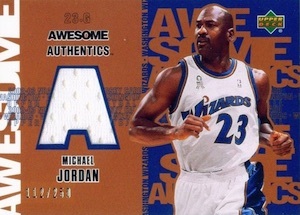 Numbered to 250, the 2002-03 Awesome Authentics jersey card for Michael Jordan is heavy on the Wizards' colors. 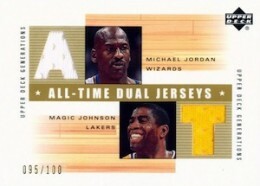 Found in the 2002-03 UD Generations, Michael Jordan is paired with some top NBA players on these All-Time Dual Jerseys cards. 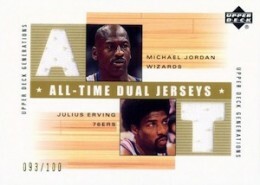 Magic Jonson, Julius Erving and Magic Johnson make for worthy cardboard counterparts to Jordan, and each card is numbered to 100. A lot of jersey cards just place the relic piece off to the side of a regular card design. The UD Glass VIP Access jersey card does a great job of incorporating the swatch into the deign. 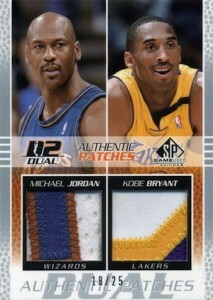 However, a patch parallel would have been a really nice option in this 2002-03 release. While the deep colors and silver foil present a dynamic look, the real appeal of this rare jersey card from 2002-03 UD Harcourt is the low print run. 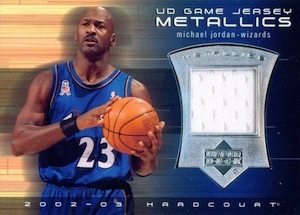 The UD Game Jersey Metallics is reportedly limited to just 23 copies. One of the final Michael Jordan game-used cards from his time with the Wizards, collectors can chase the Authentic Patches card, numbered to 100, or the dual version with Kobe Bryant. 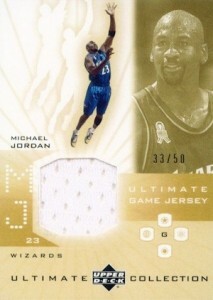 MICHAEL JORDAN 2002 UPPER DECK JERSEY NUMBERED # 100 CHAMPIONSHIP DRIVE " MINT "